Several years ago while I was enjoying a dinner with an artist friend, we were discussing our artistic careers. 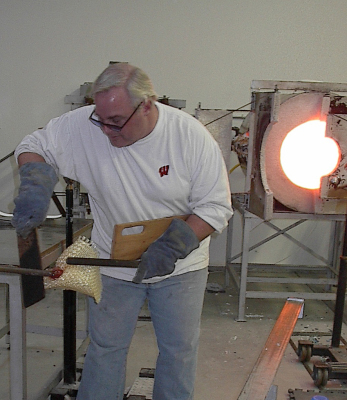 He asked what had originally attracted me to hot glass. I explained that I had seen a piece of glass that had been formed by heat and gravity into a wonderful naturally organic shape which I found irresistible. He laughed and pointed out that this is what I was still creating and how often what first attracts us is what carries us through our career. It was at that moment that I realized that, unconsciously, the natural flow and shape of the object was and still continues to be the thread that runs throughout my work. I’ve always been curious. As a developing artist, I looked for an outlet for my energy that would be challenging and compelling. I jumped into painting which I had pursued when I was younger, but a friend suggested I try stained glass which I did briefly. It was then that I discovered hot glass and fell in love. The movement, manipulation and forms possible in three-dimensional work filled me with possibilities. I was able to create shapes that were not possible with paints or flat glass. To understand how to use the glass, I wanted to learn all methods of glass work. 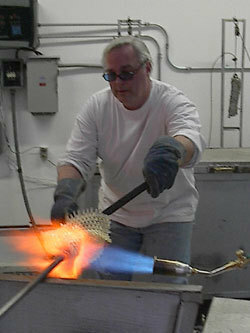 The techniques of blowing, flamework, fusing, and casting of glass taught me what was possible. With these tools, I began to create the images in my mind. I discovered weaving during this period quite accidently. I saw a picture of a piece of glass that was labeled as “woven glass” which was actually lattice, but the idea fascinated me. With my curiosity aroused, I sought the help of an artist friend who was a weaver. She taught me how to work the loom to create a complete fabric from mere threads. Ever the experimenter, I set out to do this in glass. Having gained some proficiency in glasswork, I attended Pilchuck Glass School. This was a true watershed moment. Living and working with talented artists 24/7 in an intense environment showed me how to shape my own vision. During long days, we designed, talked, and created. Evenings, we attended art lectures and slide shows. I learned to examine what beauty and grace meant to me and how to convey this to others through my work. The transition from making beautiful things with learned skills to introducing a true part of oneself into the work is a hard transition for any artist. Draping became my form of expression. The flat woven glass is interesting but not compelling. It has to drape and flow in sensuous movement to reveal itself. Years later, I am still exploring expression through movement that is natural, organic and emotional. Each sculpture I create is very personal to me, exhibiting my state of mind at the time. Some of the works happen very quickly and spontaneously, while other pieces take years of adjustment and maturity to emerge. And for me, that is the thrill. l look at a piece and it conveys a feeling. It may not be the same feeling for both of us. I am just pleased it has this power.